Chocolate Peppermint Biscotti - Chocolate Chocolate and More! 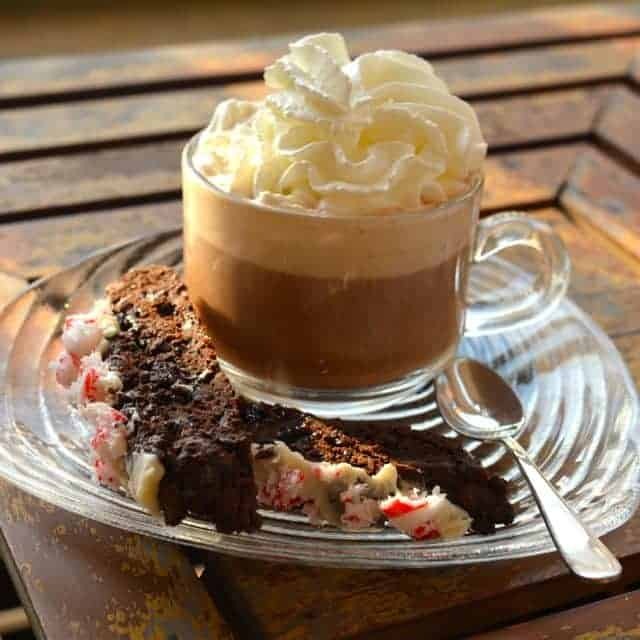 Homemade biscotti have intense flavors that put coffee shop biscotti to shame and they are very easy to make. 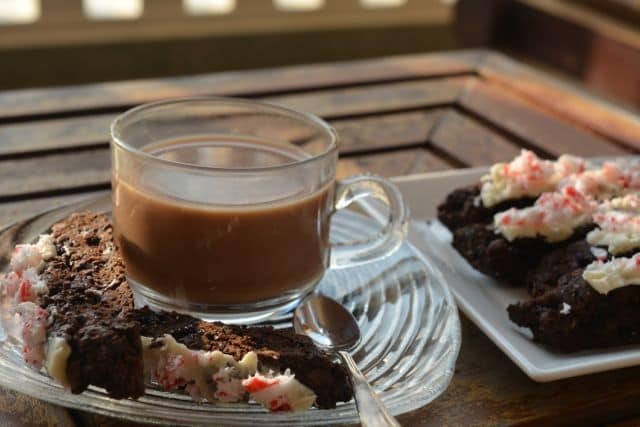 Chocolate peppermint biscotti makes a perfect addition to your morning coffee or hot chocolate. In her Swedish Christmas Cookie post, my sister called me the “Martha Stewart” of the family. Personally I feel more like the Erma Bombeck of the family- you know, the woman who wrote an essay on the joys of spit. Life was chaotic with three kids, working full time, and supporting a chronically ill spouse. Except for the times I was on maternity leave, my house was never tidy. It wasn’t dirty but it definitely wasn’t tidy either. Since I always felt behind, I was always on the lookout for ways to make my life easier without skimping on family time. Those of you with multiple kids also know that the first one is an experiment. You figure out some things that work and a lot that don’t. With the second kid, you try new things for the stuff that didn’t work for the first one. By the third, you might almost know what you’re doing (maybe). Teething was an issue in our house. We had the frozen teething rings and the rubber ones with knobs but I also bought the commercial teething biscuits with my oldest. They just made a huge mess. He’d have slobbery crumbs everywhere but his mouth. I replaced the teething biscuits with frozen fruit with my second child. It was a more nutritious alternative but every bit as messy as the teething biscuits and hard to keep for outings. I baked up a batch and Becky was in heaven. No more mess (well, much less mess) and happy baby. What’s not to like? But wait! There’s more! 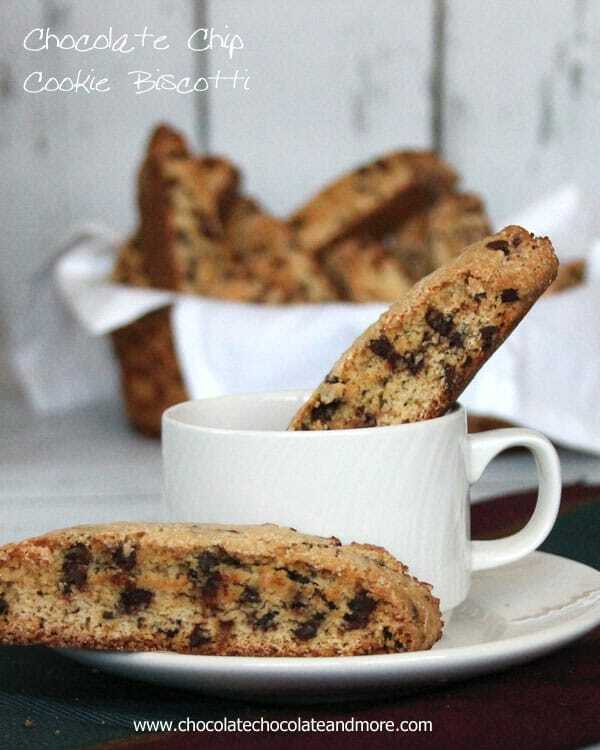 Biscotti is a sweet bread that you bake twice. The first time you bake the loaf at 350°F for 30 minutes. Then you slice the loaf and dry the slices. With all the chaos in my life, I discovered two very important things about the baking. First, it’s not imperative that you take the biscotti loaf out of the oven right at 30 minutes. If you over-bake it for 10 or 15 minutes, it’s OK. This is a god-send when one of your kids decides to bathe the cat and suffers the consequences right when the cookies are done. Second, I discovered that instead of actually cooking the biscotti slices to dry them, you can put them in the 350°F oven and just turn it off. When the oven is cool, the cookies are crisp and dry. You just have to remember to take them out before you turn the oven back on (something I occasionally forgot). Because biscotti are so simple and relatively foolproof, I started experimenting with different flavors for our church coffee hour. 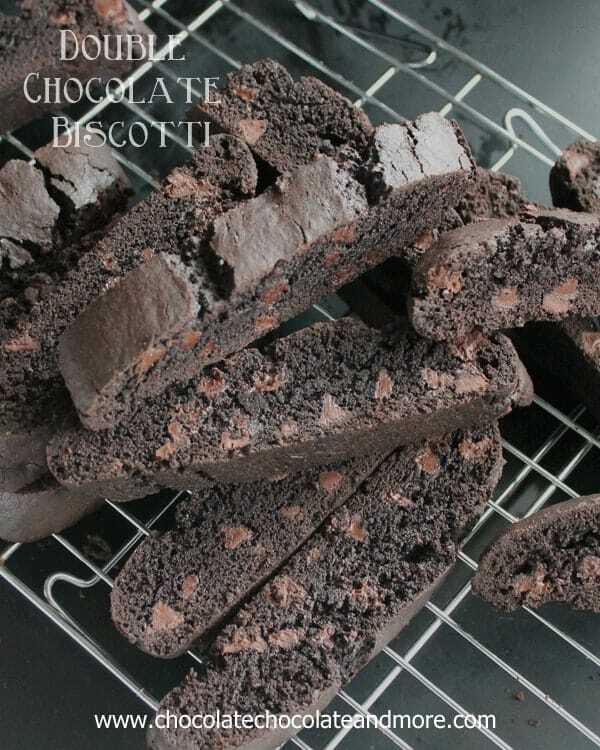 The idea from this recipe started with my triple chocolate biscotti. That recipe has cocoa powder, chocolate chips and white chocolate chips. To make chocolate peppermint biscotti, I replaced the white chocolate chips with crushed peppermint candies and vanilla with peppermint flavoring. I’ve also made black forest biscotti by replacing the white chocolate chips with dried cherries. Because biscotti keep well, I could make batches weeks in advance and they’d be fine for coffee hour. An older woman at church lamented that the biscotti were too hard for her to chew so I set aside slices before I dried the biscotti. The undried slices are soft but just as flavorful as the dried ones. Need an inexpensive Christmas gift for teachers or colleagues? 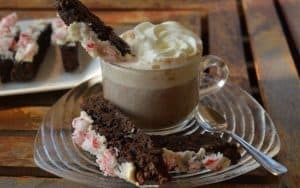 Package a few slices of chocolate peppermint biscotti, a candy cane, and a small bag of coffee or some of my sister’s hot chocolate mix in a mug or tea cup. You can find inexpensive mismatched mugs and tea cups at second-hand stores. The trick will be saving the chocolate peppermint biscotti for the gifts. My family tends to eat them faster than I can package them. Combine all dry ingredients in a bowl. Add the wet ingredients (eggs and vanilla) and stir until it forms a dough. Line a cookie sheet with parchment paper or grease lightly. Divide the dough in half. Mold each half into a log that is 12 inches long (about 30 cm). Pat the log down until it is about 1/2 inch thick (1.25 cm). Bake at 350°F (177°C) for 25 minutes. Remove loaves from the baking sheet and cool on a wire rack for at least 10 minutes. It needs to be cool enough to slice. Slice each loaf on the diagonal into 1/2 inch slices (1.25 cm). Place slices on cookie sheet and dry in 325°F (163°C) oven. Bake 15 minutes and turn slices over. Bake for another 15 minutes. Alternatively you can place the baking sheets in a 350°F oven and turn the oven off. When the oven is cool, the cookies will be dry. Arrange the slices back into a loaf and place white chocolate pieces on top. Put back into warm oven (325°F) until chocolate becomes soft. 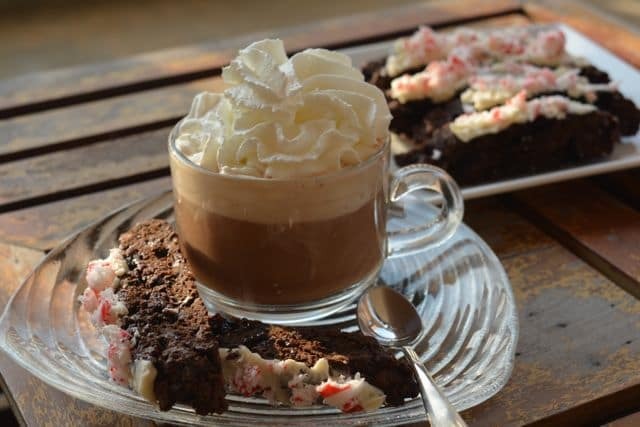 Sprinkle with coarsely smashed candy canes.